As part of an ongoing series of many CACs celebrating milestone anniversaries this year, the Indiana Chapter is highlighting their histories, leaders, and origins. Susie’s Place Child Advocacy Center first opened in Avon on April 1, 2009. Diane Burks knows she raised a daughter parents everywhere strive for. The sort of daughter who rejects “no”, rebuffs the status quo, leaves home for far-flung coastal edges of the country, and demands more and better things. That may sound like a teenage nightmare, but shepherded lightly into the right environments, a young daughter can become a community-changing force that can build something substantial. Burks started her own nonprofit agency called the Indianapolis Institute for Families. The Institute provided therapy for abused and neglected children and their families on the west side of Indianapolis. Their experience with a vast clientele became the first foray into understanding abuse and its impact on children for Burks’ daughter, Emily, who decided to continue a family tradition to attend Hanover college and begin her undergraduate studies and career in sociology. Hanover College is respected for its sociology program. But it didn’t have many social work internship opportunities in rural Madison, Indiana. So as part of a work-study style exchange program with a sister school in Philadelphia, Emily got a chance through the Philadelphia Project. “There was no position handed to you. It was a six-month program in Philadelphia, and you got a week to figure out your internship there and where to live,” she recalls. Former graduate students had worked for the Philadelphia Public Defender’s office Child Advocacy unit through the Project. The only problem for Emily was not being a graduate student. “I told them I would be sure to live up to the same standard they expected of their master’s level students,” she remembers. “My job interview was to meet that attorney in court in Philadelphia and sit with him to help with his flow through court. After my eight-hour interview at court, he offered me the internship. It was terrifying — but I’m thankful for it,” says Perry. It would be one of the first early experiences to shape her notion of challenges, expectations, and not accepting the status quo. That internship with the Project was challenging and opened a window she hadn’t yet seen of how different inner-city abuse, addiction, and poverty was compared to rural communities. It was also the first early interaction with what can be described as the seeds of an early multidisciplinary team model that is the hallmark of child advocacy centers today. After returning to Hanover, it wasn’t long before Emily picked up to move to Portland, Oregon where she began work as a state Social Service Specialist. Through her work with the State of Oregon, she learned about the CARES program and its early use of a team of professionals. CARES, short for Child Abuse Response and Evaluation Services, is still a leading model that uses a multidisciplinary team approach to help kids after abuse. Missing family and wanting to be in the lives of her sister’s new children, Emily returned to Indianapolis at the end of 2001 to be nearby and took a lead investigator position (today a “Family Case Manager”) in a central Indiana county with the Indiana Department of Child Services. She left her job with DCS and started a whirlwind of life events that would be a precursor of what was to come. By 2004 she was working on her Master’s in social work, maintained a full-time job with her mother’s Family Institute, and married her husband, Brian. By 2005 she finished her Master’s and began to solicit help for what would become Indiana’s newest child advocacy center – all while carrying her first child. Supported by her husband, mother, and the rest of her burgeoning family, Emily Burks Perry embarked on a networking crusade to establish a better way to handle child abuse cases. 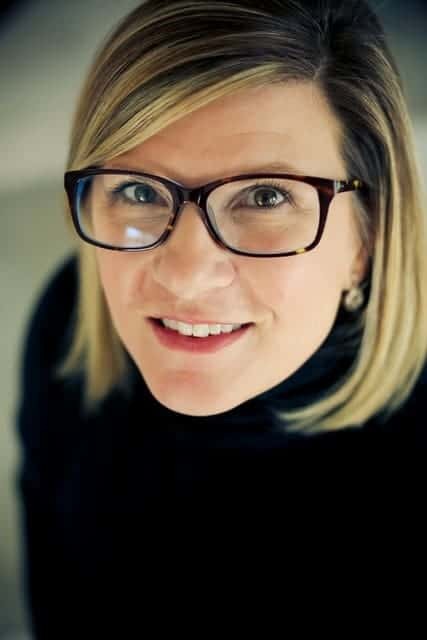 Through one-on-one therapy sessions with kids at the Institute, meeting new people in Hendricks and Marion Counties, and connecting with Indiana Chapter Director Jan Lutz, stakeholders began to coalesce around Emily’s initial vision. “I asked them to commit to pushing this project forward.” That original steering committee began to fundraise and grow for four years under the banner of the “Hendricks County Child Advocacy Center”. Knowing the Center needed a friendlier name, Emily put the question to people across Hendricks County. 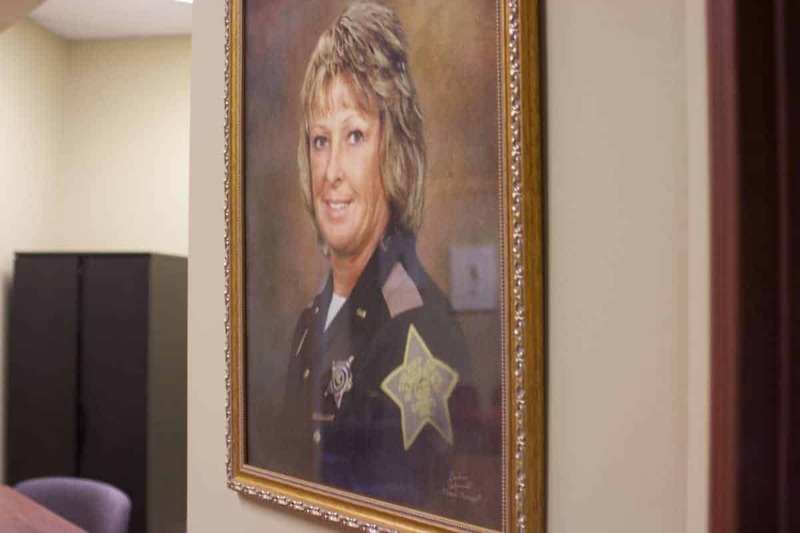 “Susie Austin’s name came up time and time again by people on the committee and in the community.” Austin was known for her support of children as a Hendricks County Sheriff’s Department Deputy and Detective until cancer ended her life in 2003 after three decades of service. She was the first female detective in the county and the first detective to investigate child abuse cases through Indiana’s first child abuse prevention network twenty-five years prior. Her surviving husband and daughter, Marisa, were overjoyed at declaring the Hendricks County Child Advocacy Center “Susie’s Place”. A portrait of Susie Austin in the original Susie’s Place location in Avon. The portrait now hangs in the entry of their new location. From her time a few years earlier working with DCS Emily knew kids who had suffered abuse came through the same police doors as people visiting incarcerated adults, walked by the same shackle benches, waited in the same waiting room as prisoners being processed, and were interviewed in the same gritty cinder-block rooms as alleged perpetrators. On April 1, 2009, Emily and the initial core of supporters gathered to officially open doors at Susie’s Place. Now kids would come through welcoming doors into an office more like their home. They would wait on comfy couches with toys or books at arm’s reach and talk about their case with Emily in a room with earthy walls and cushy chairs. Since 2009’s first hundred interviews, Susie’s Place has grown to cover thirty-six counties from two additional centers in Bloomington in 2012 and Terre Haute in 2017. The Avon location moved to a larger space in 2010. Dozens of staff members and partners from Victim Advocates, medical and mental health professionals, therapy dogs, and more forensic interviewers have continued to pour their hearts into Susie’s Place. Combined, 10,000 kids will have walked through the doors of a Susie’s Place in their area by the end of 2019. Donors have contributed hundreds of thousands of dollars to keep the priceless mission of Susie’s Place on track. “It is very hard to decipher one specific thing that is the shining moment in all of this,” says Emily. “I have so many things I’m proud of. It is always most reaffirming to hear a child say ”thank you“ or ”I feel so much better“ after coming to Susie’s Place. But it makes me even more proud when I hear a child thank one of the forensic interviewers I’ve trained. Then I know I’m passing that on and it’s growing outside of me. I love being able to see the women I work with do the amazing work that they are there to do,” she adds. The mission of Susie’s Place to be a neutral, child-friendly place for the investigation of alleged crimes against children will continue persistently for years to come. That persistence is forged out of Emily Perry’s rejection of the status quo so frequently in her life. As Emily’s mom Diane points out, “She’s also opinionated and doesn’t budge when she thinks she’s doing the right thing. And often times she’s right.” As a result, her shining moment is likely to be the formation of Susie’s Place itself.